the more precise and more powerful compressor for my CAELES air bearing table. As it makes noise it was put in a separate room, in my gym. It has been almost two months time now. Is this your favorite (best) turntable? I think some of us have been waiting for a comparison to the EMT, Continuum and Micro set ups. You’re right. Quite some time I spent on waiting for the Dürr compressor which in fact is an improvement for the air bearing preventing the intrution of dust, water or oil. The Dürr is an oil-free design. Running a very stable 5 bar pressure the air arrives in my listening room near the Caeles being split by a T adapter enabling supply for the Caeles (air bearing, dampening feet) as well for the Kuzma linear tracker. Together with the designer of the Caeles I work on small improvements. We have built additional round dampening plates taking up the three feet of the table. You see it in the image I posted. As the motor and the inbuilt quartz is provinding a stable speed we will add a speed correction feature – a so called pitch control which I believe is a must have for such a table. 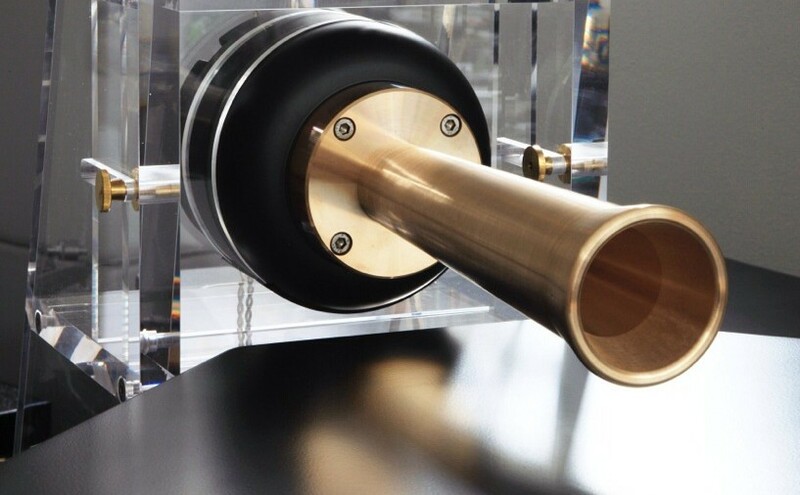 I am considering building a second arm base for a SpJ tonearm which will be a kind of challenge giving the space left. The sound is overwhelming. The true airbearing design, one of the only two I know – the other one is the big new Apolyt of AS – provides a quiet, noise free background which the special MS design with the decoupled second platter reaches too, not the EMT, Victor, Denon or Criterion.You really have no running noise at the Caeles. But this is only one aspect of the sound. The large pulley with a moving frequency of 1,11-1,50 Hz functioning as a fly wheel, the divided platter design (the support platter to which the air bearing is secured is driven by the belt while the upper platter is optimized to be free of any resonances and reflections) ,the two part sub chassis and the special base design of the tonearm avoiding transfer of vibrations from motor and bearing are somehow responsible for the fantastic dynamics of the Caeles system. I am using the included battery for the motor thus decoupling from the power net. I also built an second base taking up the ToXiom tonearm. The aluminium base is filled with quartz sand, very heavy and put on a flat leather sheet thus dampening quite well. There are more design stories to tell, maybe when I run it for much more time…being able reporting about my experiences. And I guess another version of the Caeles will see the light very soon being displayed at the High End in Munich in May 2017.